This light, breezy scarflette is self-fastening simply by folding it in half lengthwise and inserting one end through a set of large holes on the other end. 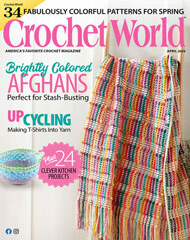 This e-pattern was originally published in the Spring 2013 issue of Crochet! magazine. Size: 7 1/4"W x 25 1/2"L. Made with size 3 crochet cotton and size E/4/3.5mm hook.